Tripp Lite's U236-000-GBW, USB 2.0 Gigabit Ethernet Adapter, allows your computer to instantly connect to a Gigabit network through a USB port - no need to open up your computer case to add an internal Ethernet card. It's also an ideal USB-to-LAN alternative for a Wii gaming console that needs network access in an environment lacking wireless capability. The adapter's compliance with USB 2.0 (480Mbps) ensures true Gigabit network speed without any compromise. Furthermore, the adapter is compact and is USB bus-powered; requires no external power adapter. Finally – a simple network connection! 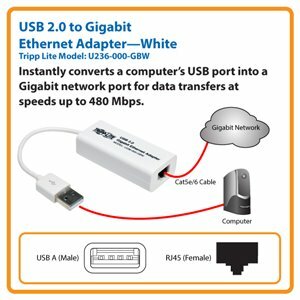 Tripp Lite’s U236-000-GBW USB 2.0 to Gigabit Ethernet White Adapter instantly connects a computer to a Gigabit network through a USB port without requiring the installation of an internal Ethernet card. This compact, USB-powered adapter offers plug-and-play convenience with no external power supply required. It supports Gigabit networks at speeds up to 480 Mbps. For peace of mind, the U236-000-GBW comes backed by a three-year warranty and has a green, RoHS-compliant design. With the U236-000-GBW, connecting your computer to a Gigabit network couldn’t be simpler. There’s no need to install an internal Ethernet card in your computer. Just plug the U236-000-GBW into a USB port and connect to a network using Cat5e/6 cable. One end has a USB 2.0 A (male) connector and the other end has a RJ45 (female) connector. The USB-powered U236-000-GBW offers plug-and-play convenience with no external power supply required. It’s compatible with Windows® 2000, XP, Vista, 7, 8, and 8.1 as well as Mac® OS X 10.6 through 10.10. This USB 2.0 to Ethernet adapter is manufactured to exacting specifications using top-quality materials. It’s compliant with IEEE 802.3 (10Base-T) and 802.3u (100Base-TX) standards and supports IEEE 802.3az Energy Efficient Ethernet. The U236-000-GBW also supports full- and half-duplex operations, suspend mode and remote wakeup via link-up, and magic packet. The U236-000-GBW is manufactured in compliance with strict RoHS specifications, reflecting Tripp Lite’s commitment to environmental responsibility. For peace of mind, it comes backed by a three-year warranty.